The Baby Boomer Generation are those people born worldwide between 1946 and 1964, that lucky generation born between the ending of the War and the coming of the Beatles. Many baby boomers see retirement and retirement planning as an adventure as opposed to a limitation. Read Robert Buford’s personal reflections on why he is proud to be a member of his generation. 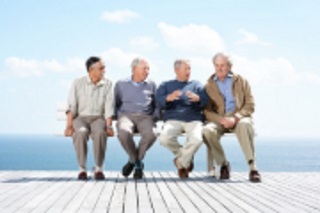 The baby boomer generation comfortable being "silver" and are actively planning to enjoy this period of their life. As baby boomers, we're far from ready for the old rocking chair. We're still very active, adventurous, and independent. Retirement, for most baby boomers, does not mean giving up working. They may just leave their current employment, or cut back on the hours they work. Many want to pursue some other type of endeavor, or start a retirement business. It does not seem like most boomers picture sitting on a rocking chair as a big part of their fulfilling retirement. Remember, the baby boomer generation believes in reform. They care about the world today, and they care about the legacy they will leave to their children and grandchildren. And this generation also believes they are well situated to consider problems and do something about them. As politicians will realize sooner or later, this generation is collectively the largest bloc of voters in the USA, and might I add that when it becomes obvious that a certain action has to be taken by our government for protection or preservation of our country and way of life, this generation comes together as one and no politician will be able to win if they are opposed to us. I realize that USA Boomers are very diverse and hold various views on religion and politics, but regardless of the fact that we rarely get along as a group in normal everyday life, at the very first sign of attack or attempted attack by another country or foreign power or group, we stand shoulder to shoulder as a rock solid populace, that no enemy can possibly overcome. Throughout history many adversaries have come to realize this, starting with the British in 1812, the Japanese in 1941, and the terrorists in 2001. The accomplishments that this generation is responsible for are numerous, and many are of great benefit to mankind. Just think back, we put men on the moon and brought them back safely, so far the only nation to do so. Our communication ability went from the normal telephone, radio, and black and white television to instantaneous worldwide communication by cell phones, video, and the internet. What happens on one side of the world can be heard and seen by someone on the other side in micro seconds after the occurrence. Medicine has learned how to transplant human organs from a recently deceased to a live patient. We have learned to predict weather so close to what becomes reality it is possible to save countless lives from the dangers of weather related catastrophes. One day we will be able to do the same with earthquakes. We have conquered and made extinct many diseases and maladies that killed people 100 years ago. We are the generation that showed our parents how to get multitudes of strangers to gather together in peace and harmony, even though we didn't all see eye to eye. Of course I'm talking about the "experiment" back in the sixties known simply as Woodstock. Yes, as I said, I am extremely proud to be able to tell anyone that will listen that I am a member of the Baby Boomer Generation, and would have it no other way. This article was written by Robert Buford from the boomer generation.